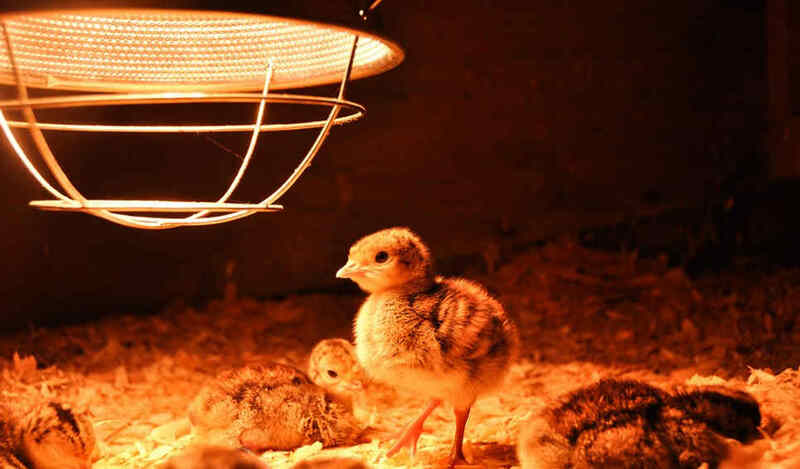 ​What Type of Heat Lamp for Chickens is Ideal? ​Surprisingly, heat lamps offer many health benefits for chickens. The heat can help to increase the air temperature in their living space. This can help lead to better blood circulation in their bodies .A heat lamp works to warm the chickens so they don’t have to use all their energy to warm themselves. This can result in a healthier chicken. A heating lamp is easy to use, but there are some safety tips to keep in mind when using one. You want to make sure that the heat lamp doesn’t get too hot. If it does, it could end up burning the living space of the chickens which could cause a fire. It could also end up hurting the chickens as well as too much heat can negatively affect them. ​Should I Still Use a Heat Lamp If It Could Cause Fires? ​Fires caused by heat lamps are usually due to using too high a wattage or not keeping the bulb high enough off of the ground. Fires can occur due to the bulb in the heat lamp overheating materials, such as the cardboard and paper in the chickens’ living space. You should always keep an eye on the heat lamp and make sure it is high enough off of the ground, as mentioned in the section above. If you follow these tips, heat lamps will work safely to help warm your chickens. ​What is the Difference Between Regular Light Bulbs and Infrared Lights? ​As you’ll find with many heat lamps, they can use light or just heat. Many times regular light bulbs aren’t used because they emit a lot of light. This light can create an artificial glow with its bright colors which can irritate chickens. An infrared light works to emit a warm and soft glow into your chickens’ living space. The glow from a heat lamp won’t irritate them and will help them to better warm themselves. ​How Hot Should a Heat Lamp Get? ​What Color Bulb Should I Use in the Heat Lamp? Heat lamp bulbs often come in different colors, such as red and white. Red is often considered the ideal color to use because it is a warmer color and therefore can cause a more calming atmosphere for your chickens . In fact, it’s been proven that red infrared lighting is effective in many ways to help blood circulation and egg production in chickens. ​This heat lamp is made with a white porcelain socket. It runs on 100 watts and 110 volts. This heat lamp doesn’t emit light, which helps to provide a more comfortable atmosphere for the chickens. The heat provided by this lamp also helps to provide a better sleep and improves the chickens’ circulation due to it increasing the air temperature. This heat lamp is also waterproof. This heat lamp can rise to warm temperatures very quickly. This is a useful feature because you want to have a heat lamp that will quickly heat up to help your chickens. It is an inexpensive heat lamp choice. This means you can invest in this model without fear of breaking the bank. This heat lamp can last up to 10,000 hours. This is a good feature as you probably don’t want to invest in a heat lamp that will quickly lose its power. While this heat lamp can reach high temperatures, this heat can sometimes get to be a little too much. You’ll have to be sure to watch it when it’s on to make sure it doesn’t overheat. It can quickly warm the chickens’ living space to a cozy temperature. The anti-chew cord measures 16 feet long. This is a useful length as it will allow you to easily reach electrical outlets so you can plug it in. It doesn’t come with a bulb. You’ll have to buy one yourself before using this heat lamp. You can’t use bulbs larger than 250 watts. If you do, it could end up resulting in a fire.• This product does tend to be a little on the more expensive side. This heat lamp is not waterproof. If you plan to use it outdoors, it might not be able to withstand certain weather elements. This heat lamp can burn up to 25,000 hours. This is a useful amount of time to have with a heat lamp. This way you don’t have to constantly keep checking to see if you need to replace it. It is a durable heat lamp. If the ceramic body of this heat lamp is bumped against you don’t have to worry about it breaking. This durability also helps add to its lifespan. It can reach warm temperatures quickly. These warm temperatures will stay consistent and won’t diminish. This heat lamp can only be used in a porcelain socket. If it’s placed in another type it could end up causing some problems. It is not waterproof. You’ll have to carefully watch it and make sure there is no type of water nearby to help prevent possible electric shocks from occurring or to make sure the water doesn’t somehow damage this product. ​This heat lamp is made with a porcelain socket and features a 10 inch aluminum reflector shade. It can reach temperatures up to 105 degrees and can use a wattage up to 250. A vinyl cord is used to plug this heat lamp into an outlet. It also comes with a hanging hook. ​It comes with a clamp which will help make hanging it easier. This clamp will also help to prevent it from falling. This clamp is large which is a good feature because it will help to secure the heat lamp better. The vinyl cord is 6 feet long. This is a useful length as it will help make it easier for you to plug it in if the outlet is located further away from where the chickens are. No instructions come with this heat lamp which might make it a little confusing to set up. The black phosphorus bulb helps to imitate both day and night. This feature can help to create a more comfortable atmosphere for your chickens as the bulb won’t be emitting a bright artificial light. It is made of high-quality materials. These materials help it to emit heat longer and will also help add to its lifespan. This heat lamp can quickly reach warm temperatures. This way your chickens will be instantly warmed. It can sometimes heat up to very high temperatures. You’ll have to be very careful not to touch it when it’s on or you could end up burning yourself. You also need to make sure to occasionally check the temperature to make sure your chickens aren’t in an uncomfortable environment.